Whether movies, shows or old home recordings, watching VHS tapes is generally no longer a practical option—most people don't have a VHS player in their homes anymore. If you find that your old VHS tapes are just taking up space and gathering dust, there are a variety of ways to get rid of them. And if they contain footage you don't want anyone else to see, well then you can destroy them without too much trouble. There are several options for this, so decide what you'd like to do based on convenience, availability and preference. One method is to microwave the tape for 35 to 60 seconds. This won't cause your microwave any harm, but it will melt the plastic parts of the VHS so it won't play anymore; however, the actual tape will probably remain mostly intact. If you want to destroy the tape, thus eliminating any chance of it ever being viewed again then you're better off removing the tape from the VHS cartridge and putting it into a toxic solution such as paint stripping liquid. You can also cover it in gas and burn it - however VHS tape is extremely flammable, so make sure to use extra precaution when trying this. In any case you'll want to be in an open and well-ventilated area when trying either of these options as to avoid inhaling toxic fumes. If you want to avoid fumes and potential danger, you can always take the tape outside and pound it with a hammer. However, this is messy and might feel a little silly. The more professional and efficient option is to drill a hole right through the tape. Make sure the tape is rewound and place it on its edge with the left side up. Then drill a hole through the tape to the center of the reel. A 3/16-inch hole should do the job. This can be done to multiple tapes by holding them together with a clamp and then drilling through them all one after the other. Reuse your old VHS tapes if you aren't set on destroying them. If you have VHS tapes that you just don't want and don't contain material other people can't see, then you might want to consider making them available for reuse. If you have tapes that feature cartoons, movies or TV shows, you could donate them to your local children's hospital video library. If this sounds a little ambitious, you could also just drop them off at a local charity. And if you think someone might even pay you for your old VHS tapes, you could try selling them on ebay or Craigslist. If you have certain themes such as "Star Trek" or "Richard Gere," then you might try bundling the tapes into groups when you try to sell them, which should sweeten the deal a bit for potential buyers. Recycle your old VHS tapes. 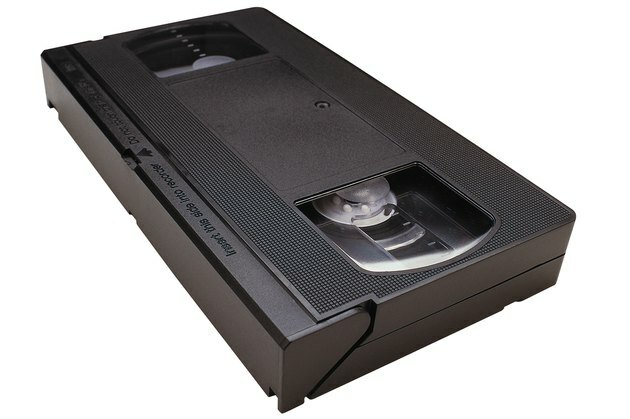 Again, if you don't necessarily need to destroy the footage on your VHS tape, you can recycle them in an environmentally friendly manner by finding a local technotrash disposal service, which usually dispose of old technology in a responsible way where the parts don't just end up in landfills. Places like these will also generally guarantee to destroy the footage on the VHS tapes.